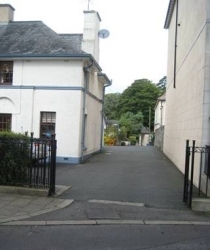 Go straight through the mini roundabout as you come into Rostrevor and go up a slight hill into the main square. On your left there are large mature oak trees with a car park behind them. Turn in through entrance on left between first two trees. You will immediately see the house in photo on right (10 The Square). 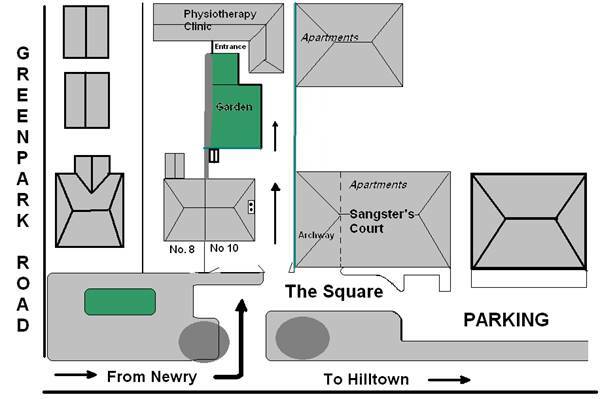 The clinic is located at bottom of driveway in photo between house and large archway for Sangster’s Court as shown in Map above. As you come down to bottom of hill from Hilltown the car park is on right just past the Church of Ireland. Clinic entrance is on right at Warrenpoint end of car park. Immediately after the entrance to Kilbroney Park, turn left at the fork in the road and continue on into Bridge Street in Rostrevor. You will eventually reach a T junction and you will see the entrance to the parking in Square immediately across the road between first two trees.